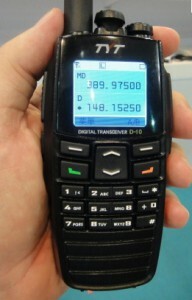 looking for others who have purchased these new Dual Band, analoge & Digital handsets. Handsets robust and good quality feel to them and so far appear to be functioning well, however looking for others to swap info with etc. I have also had mixed feedback on their alledged compatibility with Mototrbo handsets. Some sellers are claiming they work others not so sure. Here is the spec for the tec guys here. DM-UVF10 is a dual display, dual standby two-way radio, adopts high-technology and novel design, bringing you a stable, reliable and efficient communications service. It is especially convenient for Staff of Property Management and entertainment. DM-UVF10 adopts humanism design, making it smart in shape, advanced in function and flexible in operation, with function of DTMF, voice scrambler and voice compander, will satisfy you and can hardly tear yourself away from it. More fantastic function,DM-UVF10 will take you to enjoy them. After reading the specs it says its an fdma set so wont be compatible with the motorola trbo sets instead it would be for usage with the kirisun fdma range etc but i could be wrong ? i've found with all the chinese digital radios that they have there software bugs that need ironing out still so if i was you i,d go with either a genuine motorola , hytera ,or for less cost the connect systems cs700 . FSK = Frequency Shift Keying & the four tells us it's 4 tones not the standard 2 tone FSK. So it has a higher bit rate & my understanding, from a google search, is that Mototrbo is also a 4FSK mode. But not being interested in digital modes I do not know if all 4FSK modes are the same, in the same way that all F3E (FM) tcvrs of the same or similar bandwidths can communicate with each other. Does anyone know if the TYT DM-UVF 10 is compatible with any of the other Chineese dPMR handsets ie the Kydera DP-550S, currently on sale on ebay or any of the Kirisun models? Thanks in advance for any help or experiences anyone is currently having. I'm using the TYT's and so far im very impressed with build quality, and audio quality especially in secure digital modes.. Very nice that this is a dual band digital and analogue radio but sadly just the one digital mode dPMR. So to clarify this is not DMR but just dPMR meaning it will work with digital PMR446, the Kirisun dPMR and other dPMR range models ONLY. It will NOT work with or decode DMR, Mototrbo, Nexege or D-Star etc. just wondering if anyone has managed to find out what other cheap chineese dPMR radios are compatible with this unit? and also if there is a mobile model that will be compatible? Thanks all for reading and any info you may have. chrisinuk wrote: just wondering if anyone has managed to find out what other cheap chineese dPMR radios are compatible with this unit? and also if there is a mobile model that will be compatible? Any other dPMR UHF radio should be compatible that is the idea of the dPMR standard. So Kirisun dPMR etc. would be compatible. Still no DMR Dual band radios on the market? There is a huge market for them out there i am sure the first to release one will make a killing!